A conversation with the former labor secretary and merry-eyed agitator about the great ill that ails the country. Lizzy Ratner: Why make a film about inequality? 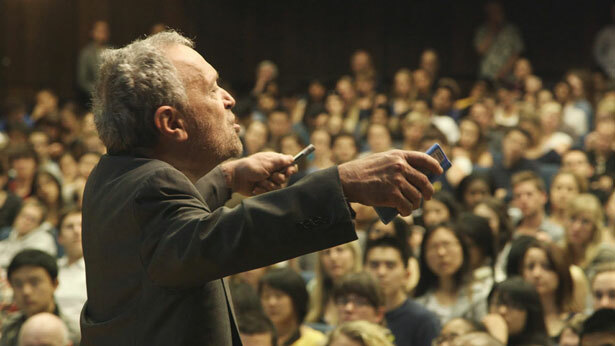 Robert Reich: I don’t know a great deal about film as a medium, but I’ve tried everything else. I figured, this is sort of the last frontier for me. If I can’t reach people through film, I don’t know how I can do it. This whole area of widening inequality in income, wealth and opportunity is rapidly getting out of control. It’s very important that people understand it. And it’s too easy to caricature—by the right, as essentially a problem of poor people not taking responsibility, and by the left, as essentially a matter of greedy CEOs and Wall Streeters. Those caricatures are both wrong. It’s systemic; it has to do with how we’ve organized society. LR: An updated study by economists Piketty and Saez came out recently that says that as of 2012, post-recession, the rich are getting richer and everybody else is staying where they are. Weren’t we supposed to have fixed this? RR: We didn’t fix it, and this is really the point of the film. We fixed it in the 1930s; we made great headway in the ’40s, ’50s and ’60s; but beginning in 1978, we turned our backs on the problem. Mothers flooded into paid work, and we all worked more hours—and then, beginning in the late 1990s, we borrowed against the rising value of our homes. All of those coping mechanisms for maintaining living standards in the face of stagnant or declining wages are now exhausted. So we have no choice but to face reality. LR: What happens if we don’t confront this as a society? RR: We can’t go on in the direction we’re going. For one thing, as we learned after 2007 and, before that, after 1928—both peaks of inequality—the economy can’t function when the vast middle class doesn’t have the purchasing power to keep the economy going. This is not simply a matter of unfairness and social morality; it’s also a very practical economic problem. LR: I’d love your judgment on the Obama administration and what it’s done so far to get us into, or out of, this inequality mess. RR: Well, the Affordable Care Act is important, and I think that we will look back on the Obama administration and see that as the signal contribution. In other respects, the Obama administration has not done very much. To be fair, [it] has faced a more disciplined, recalcitrant and right-wing Republican Party than any recent Democratic administration. LR: You were an adviser to Obama in 2008 on the transition, and then in came Rubin, Geithner, Summers, the whole crew. What happened? RR: It’s a good question. I felt that in the transition, a lot of important arguments were being made, and the president-elect seemed quite eager to hear them. But very rapidly a cohort of economic advisers emerged who were, let us say gently, not particularly progressive. LR: In some ways, it mirrors what happened in the Clinton administration. RR: It’s hard to overstate the power of Wall Street in setting an agenda. I think it’s very easy for progressive voices to be drowned out. LR: If Bill de Blasio becomes New York City’s mayor, how can he make good on his promise to right the inequality that’s at the heart of our city right now? RR: Well, he can make good on his promise only if people continue to put pressure on him and continue to be mobilized in ways that make it possible for him to take on the established structure of power. Too often, I think, we elect people who we assume are going to make fundamental changes, and then we go home and do whatever we were doing before without realizing that an election is just the beginning of the challenge. They need all our help and support if they are going to succeed. In August, The Nation’s John Nichols argued that President Obama should appoint Robert Reich as head of the Federal Reserve.